Turn heavily-armed marines and rival xenomorphs into bloody chunks on your smartphone or tablet. Whoever wins, we lose. At this point, Hollywood should either give up on the tarnished Alien Vs. Predator license or do the unthinkable...actually give a damn. As for video game publishers and developers, by all means, please continue to release titles featuring these creatures. A few stinkers exist, like the infamous PSP AvP, but for the most part, games starring these movie monsters are quite enjoyable. Even the old Atari Jaguar creation provides a few hours of fun. With this in mind, Angry Mob Games (with the entertaining Predators under its belt) is hard at work on Alien Vs. Predator for iOS and Android, due out sometime in November. 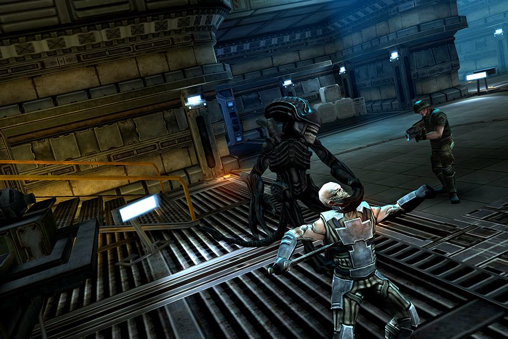 Powered by Unity, the visually appealing hack-and-slash adventure will come with 21 stages, giving users the chance to play as both the Alien and Predator while making use of the characters' unique abilities. With that, yes, the Predator will have camouflage and heat vision, while the Alien strikes with tail attacks. Meanwhile, space marines will run around making life difficult. Nothing a good decapitation won't fix. Thus far, the game looks outstanding, and with hopes of Retina support, could easily become one of the prettiest mobile titles of 2012. As for the gameplay, cross your fingers.